Colseon, one of our friends sons, graduated from High School last night here in Mozambique. We are so proud of him! Well his mother and I were talking and I was telling her about this bag I had seen that said “I love Africa” on it and she said it would be great if I could make him something like that for him to take to college. Coleson has grown up for most of his life (since before school started) in Africa and so the idea of taking something that said I love Africa to school as a reminder seemed like the perfect idea. And of course the pillowcase is recycled from an old curtain. 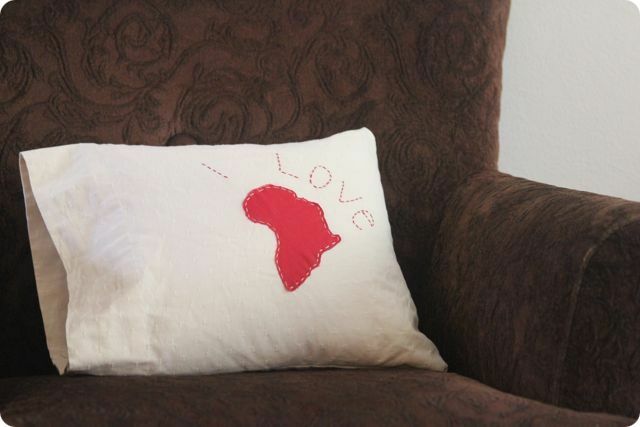 This entry was posted in Africa, DIY on May 31, 2011 by Deanna. Great job on that map/outline of Africa. Super good.